1. 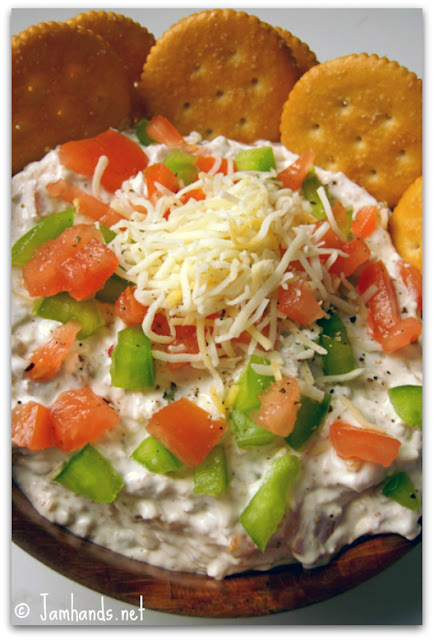 In medium bowl, with mixer, blend sour cream, mayonnaise, cream cheese, cheddar cheese, chopped onion and green pepper, garlic powder, and black pepper. 2. Crumble bacon into small pieces and add to mixture. Add chopped tomato and stir well. Garnish with shredded lettuce just before serving, if desired. 3. Serve with Townhouse crackers or Wheat Thins. Also good served in a bread bowl with bread cubes to dip. Oh my goodness this photo is beautiful. I for sure will add this to my appetizer list. Bacon and cream cheese....please! It HAS to be good! Bacon makes everything better, going to make this for the Fourth of July!